European Commissioner for Development Andris Piebalgs yesterday signed development programmes for 21 African, Caribbean and Pacific (ACP) group countries and Guyana’s allocation is Euros 34 Million ($9.28B) over the next seven years. A release from the European Union yesterday said that the funds for Guyana will focus mainly on climate change adaptation and disaster risk reduction, including sea defences. The agreement was signed in the Pacific Ocean island of Samoa. The funds have been allocated to the countries’ National Indicative Programmes under the 11th European Develop-ment Fund (EDF) for the period 2014-2020. Minister of Foreign Affairs, Carolyn Rodrigues-Birkett signed the deal with Pielsbag on behalf of Guyana. The signing occurred on the sidelines of the UN Third International Conference on Small Island Developing States. Aside from Guyana, the signatory countries from the Caribbean are Antigua and Barbuda, Barbados, Dominica, Grenada, Jamaica, St Kitts and Nevis, St Lucia, St Vincent and the Grenadines and Trinidad and Tobago. He added “For the European Union it is essential that our programmes are drawn up in close cooperation with our partner countries, based on governments’ own policies and strategies and reflecting their stated needs. This is how we ensure that programming documents really support areas where the EU can add value”. EU Member States agreed in 2013 the overall amount for development cooperation that will be directed to 78 ACP countries through the 11th EDF. The National Indicative Programmes that were signed yesterday define the strategy and priorities for EU aid in each particular country and were done in close cooperation with the partner countries. One of the programmes that is likely to be financed for Guyana is the second phase of the Mahaica-Mahaicony-Abary Scheme. Agriculture Minister Dr Leslie Ramsammy has mentioned the project twice in recent weeks and said it will be 30M Euros (US$41M). While Phase Two of the MMA is still at the funding clearance and ministerial level, the National Drainage and Irrigation Authority has met with EU representatives, exchanging technical data on the contours of the project which straddles regions four and five. Ramsammy had stated during the recent presentation of the 2013-2020 National Strategy for Agriculture that the first portion of the MMA-ADA Phase Two will take up to five years and should make available up to 200,000 acres of land in Mahaicony. Part of the project will be the damming of the Mahaicony River which is expected to ease flooding in the area. Phase two of the MMA project will focus on the Mahaicony area. Phase two and three of the project were to be completed decades ago, however only the Abary segment was ever completed. Critics say the Abary segment is not functioning the way it was intended and it may have to be reopened and re-engineered before the other phases are tackled. Phases two and three are seen as critical to protecting Mahaicony and Mahaica from deep flooding and to open up more lands for rice farming. This entry was posted in Development / Investment and tagged Stabroek News on September 3, 2014 by Osei Browne. Chief Executive Officer of International Pharmaceutical Agency Guyana Inc (IPA), Lloyd Singh, is alleging that the Ministry of Health changed the criteria for drug supplies after it had already invited companies to apply for a pre-qualification status. 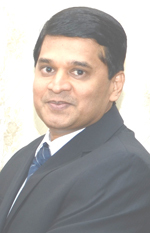 This information is documented in a motion filed by Singh in the High Court, to reverse the decision of the National Procurement and Tender Administration Board, which decided that based on the revised criteria, the New Guyana Pharmaceutical Corporation (GPC) will be the sole prequalified supplier until 2016. Singh in his petition to the court noted that on 26th November last, the Ministry of Health advertised in the Guyana Chronicle, invitation for companies to submit tenders to be prequalified for the supply and delivery of pharmaceuticals and other medical supplies and consumables for the period 2014 to 2016. According to Singh, the purported revised evaluation criteria appeared for the first time among the bidding documents some time after the advertisement was published. Under the contentious revised criteria, bidders had to demonstrate a gross annual turnover of US$5M and net assets of US$2.5M. Another criterion was that maximum score was to be awarded to applicants who would have paid $50M in Corporate taxes, annually. Additionally, the company that has 50 or more employees, and warehousing capacity of 30,000 square feet in the city, will also gain an edge. Singh also lamented the fact that despite the invitation being published in November 26, it was not until 20 days later in December that the company was informed of the list of required items to be supplied. At the time of the announcement of the revised criteria, many stakeholders had been critical of the Ministry saying that they were tailored to suit the New GPC. New GPC is owned by Dr. Ranjisinghi ‘Bobby’ Ramroop who happens to be the best friend of former President, Bharrat Jagdeo. That company has been supplying the bulk of the drugs to Government for the past 15 years, ever since it was acquired by Ramroop in 1999. Leader of the Political Opposition, Brigadier (Rtd) David Granger, is on record castigating the decision by the Ministry, saying it created a situation where rivals of New GPC would not be able to meet the criteria. Granger said that what the Ministry has done is to devise tailor-made criteria which are meant to negate other competitors so that New GPC will be used as the sole supplier of drugs. In July last, Head of the Presidential Secretariat, Dr Roger Luncheon, announced that the Tender Board found New GPC to be the only of the seven companies, which had applied, to have met all of the criteria. Ansa Mcal was the first of the other companies to publicly lament the decision in favour of New GPC saying evaluators did not even visit its facilities. With billions of taxpayers’ dollars at stake, independent suppliers and the Opposition have time and again been accusing Government of favouring New GPC, a company whose principal, Bobby Ramroop, shares close ties with former President Jagdeo. The company has been benefiting from billions of taxpayers’ dollars annually, controlling supplies of up to 80 per cent of the drugs purchased by the Georgetown Public Hospital Corporation (GPHC) and the Ministry of Health. New GPC has been a feature in the Auditor General’s report over the years with several instances focused on multi-million-dollar deficiencies in the procurement and supply of drugs to Government. The purchase of drugs this year is expected to surpass US$25M. The purchases have been a major source of contention between Government and the Opposition for years now because of the seeming close relationship between its main principal and the Administration. This entry was posted in Health and tagged Kaieteur News on September 1, 2014 by Osei Browne. Drug agents from the Customs Anti Narcotics Unit (CANU) have detained a popular Waini River businessman as they intensify their probe into the discovery of a semi-submersible vessel in the Guyana jungle two weeks ago. The man Michael D’Anrade, who operates a large grocery and general store in the Waini River area, was removed from his home by CANU agents last Friday night before being transported to the city on Saturday for questioning. The local drug agents are hoping that the businessman would be able to provide them with information about the owners of the vessel, which they believe is linked to the illegal drugs trade. 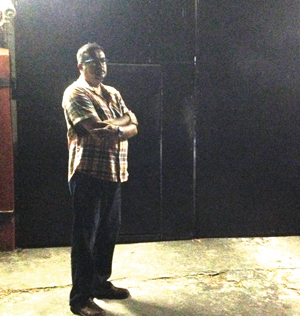 Attorney at law Glen Hanoman waits patiently outside the CANU headquarters on Saturday night to see his client. From all indications, the businessman has already gone though some intense interrogation although he has repeatedly denied any link to the vessel or the persons who are associated for it. After initially being denied access to a lawyer, D’Anrade was eventually allowed a brief conversation with attorney at law Glen Hanoman yesterday. Danrade, according to reports, had telephoned his wife on Saturday and instructed her to contact Hanoman, who he requested to meet him at the CANU headquarters where he was being held. On Saturday, night this newspaper was outside the CANU Headquarters on Homestretch Avenue when Hanoman turned up and was denied access to his client. A man who claimed that he was just a security guard at the gate, kept the attorney waiting for more than 30 minutes while he sought instructions from his superiors on whether or not to allow Hanoman in. He eventually came back and stated that D’Anrade was not at the location, but changed his tune when Hanoman insisted that the businessman had telephone his wife from CANU headquarters a few hours earlier. The guard then told the attorney that he had received strict instructions not to allow him to see the client and advised that he returns on Monday since it was already late in the evening. When he was asked by the lawyer who issued the instructions, the guard replied that the US Embassy had issued the order. With that, the attorney smiled and walked away. CANU is reportedly being assisted in their probe of the narco sub by the United States of America’s Drug Enforcement Agency. Yesterday, Hanoman was eventually allowed a brief audience with D’Anrade, but was rudely interrupted while he was receiving instructions from his client. “I have not had any effective communication with him. CANU believes that they are doing me and my client a favour by allowing me to see him,” the attorney stated. According to Hanoman, D’Anrade owns the largest grocery and general store in the Waini area and is a major supplier to persons operating there. D’Anrade’s store is located several miles from where the narco sub was discovered. “He managed to tell me that they (CANU agents) went to him and asked him if he knows anything about the sub. He told them that he had dealt with some people who told him that they were building a boat several miles from his location,” the attorney told this newspaper yesterday. Kaieteur News understands that the businessman had sold supplies in the form of ration to the persons. “It was only when the CANU people took him to where the boat was discovered that he knew what was taking place,” Hanoman said. The Self Propelled Semi-Submersible (SPSS) was more than likely built at the camp site in Waini River, North West District, Region One. Following the discovery of the vessel CANU had said that based on intelligence from an ongoing investigation, a number of its officials along with Guyana Defence Force Special Forces, Coast Guard and Air Corps, conducted an operation along the Waini River in the North West District. During a search of one of the creeks branching off from the Waini, a blue vessel, later identified as a SPSS, was discovered about two miles in, along with a camp consisting of three structures – including accommodation, workshop area and generator. The accommodation area had the capacity to house approximately 12 persons. There was also a kitchen located within the accommodation. The workshop consisted of pulleys, power tools, paint, and several fiber glass materials. Based on the items present, it is evident that this area was used to build the SPSS found in the creek, CANU said. The vessel was already fitted with a diesel engine and steering wheel, navigation and other machinery to deem it serviceable. There was no contraband on board the SPSS, CANU said. The discovery of the vessel would strengthen what has been known all along…that Guyana is a trans-shipment point for cocaine and other illegal substances. It would also point to how well organized the drug network is. This entry was posted in Crime on September 1, 2014 by Osei Browne. If the layperson is confused by the goings on at the Rodney Commission of Inquiry it would be an understandable understatement. Listening to the behavior of counsel representing the various interests would leave anyone in a state of bewilderment. People are puzzled about whether all parties to this public spectacle really know what respective roles they are expected to play. On the one hand there are counsels for the Commission; one would have thought that their role would have been to seek clarity on ambiguous and other murky local issues for the benefit of the Commissioners. On another hand there are the counsels for the parties purportedly involved either directly or peripherally in Walter Rodney’s death. Thirdly there is the perception that among the Commissioners, confusion is multiplied by an adoption of positions that are at variance with their supposedly objective status even before they are required to pronounce on the findings of the Commission of Inquiry. Those few observations are intended to highlight the confusion that beset the Guyanese viewing and listening public. First off, the Terms Of Reference for the COI, although contentious in significant ways, bring into question the real reason for holding such an inquiry at this time. This is surely cause for speculation especially when the author(s) and cause of that great man’s demise have been arguably identified by conventional wisdom for years. Some commentators have opined that the governing minority would like to bolster its elections fortunes by holding what is increasingly analogous to an ad hoc affair characterized by sometimes spurious allegations and unsubstantiated personal opinions rather than a serious attempt to arrive at the truth. As a matter of opinion, the Rodney COI runs the very real risk of losing whatever little credibility it has left. What is apparent also is that counsels seem not to be prepared for the witnesses; no work seems to be done in terms of research of the political and other considerations that have be major philosophical influences on witnesses and other interested parties. Another mockery of the process is the disorganized appearance of witnesses. It is a matter of fact that an audience will most likely remember evidence in chief as the last word if no opportunity is provided counsel for other interests to examine the testimony presented. Note that no mention is made here of “cross-examination” because the concept surely does not apply in the extant circumstances. Instead of “cross-examination”, maybe someone could advise counsel that their role is to seek clarification of ambiguities, and to explore other conclusions for a historical act/fact rather than take an adversarial stance in representation of their clients’ interests. Tacuma Ogunseye puts it rather aptly when he offered a few suggestions to counsel for the PNC on how a witness should be handled as against attempting browbeating tactics. That such an approach has the potential of being similar to shooting oneself in one’s foot is not lost on the more informed among us. It runs the risk of antagonizing witnesses who for the most part are there to express their version of the truth and cannot be deemed hostile witnesses. Interestingly, since the start of the COI, there really has been no witness testimony to refute opinions adduced thus far. Mention was made earlier of listeners remembering evidence in chief particularly if counsel for various interests did not get the opportunity to examine witnesses to elicit another conclusion of what has been accepted as fact. The point remains that all of us have our own interpretation of what is truth even in the face of undeniable fact. Why certain witnesses have not been recalled so far will forever remain a mystery, although conventional wisdom has it that a particular plan backfired spectacularly, placing credibility in jeopardy. It is perhaps advisable that Commissioners are not counsel for parties and therefore should avoid any appearance of posing provocative questions, and/or taking antagonistic positions which might indicate a not so subtle alignment with preconceived notions. It might be a good thing if all parties, including the Commissioners re-examine the paraphrased adage that “justice must not only be done, but must also appear to be done” which can serve to erase the confusion that currently exists. This entry was posted in Editorials / Letters and tagged Kaieteur News on September 1, 2014 by Osei Browne. The Opposition parties, A Partnership for National Unity (APNU) and the Alliance for Change (AFC) say they are going ahead full steam with a No- Confidence motion against the People’s Progressive Party/Civic (PPP/C) Government in the National Assembly. The combined opposition has stated that they have no confidence in the manner in which the government has been operating over the past years. If this motion is passed, elections could be just around the corner. But former Government Minister under the People’s National Congress (PNC), educator, women’s rights activist and Psychotherapist, Dr. Faith Harding does not believe a No-Confidence vote would solve anything. Additionally, the former Minister of State and Minister within the Public Service under President Desmond Hoyte, does not believe the opposition is ready for elections. Speaking exclusively to this newspaper recently, Dr. Harding believes that Guyana’s political situation has reached an “unfortunate” state after so many years of Independence. “We still don’t know to collaborate and cooperate and work on behalf of our people and the development of the nation,” she stated. She said the incumbent will always have a higher level to operate on in terms if financing and public interest. When asked where the opposition parties, particularly, APNU have fallen down, the veteran mental health practitioner opined that the opposition does not really listen to their people on the ground. 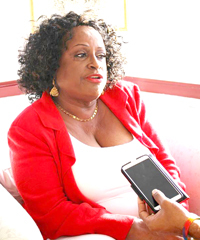 She stated that the opposition has fallen down in appreciating Guyana, and in bringing the wrong things that the government does to a position of, ‘this is how I would do it and this is what needs to be done’.” “No, they will criticise— not in a sense that people can understand— you look at all the Bills and this No-Confidence Motion— where was the cooperation and understanding?” she questioned. Dr. Harding noted that the opposition has fallen down in that way. But she also blamed the government for not fostering an attitude of partnership. This entry was posted in Government, Politics and tagged Kaieteur News on September 1, 2014 by Osei Browne. After months of contradictory statements, the PPP/C government is still to make a cogent and believable case as to why long-awaited local government elections have not been called. Its failure will cement in the minds of many -including its supporters – that in its weakened state it is unwilling to risk a loss in key areas which could frame it as a lame duck at general elections. As we have said before in these columns the PPP/C government is putting its own fortunes ahead of the country’s interest. It has now opened up a new front. Whereas it has unconvincingly argued that the electorate is not ready for local government elections it is of the view that the people are more ready for general elections even though there are few differences between the two systems and basic voter education would have taken care of any gaps in knowledge. While more in favour of general elections, that hasn’t stopped the ruling party and the government from embarking on a cynical campaign to undermine the credibility of the electoral system and to cast aspersions on it. How else does one explain the weekly mutterings at the PPP/C press conference by General Secretary Rohee about a sudden inflation in the size of the list of persons eligible to vote and sundry non sequiturs such as 18 persons registered at one location in Georgetown and the name of the late former President Arthur Chung being on the list. In his other capacity as Minister of Home Affairs, Mr Rohee would be well aware that it is the General Register Office, which comes under his own ministry, which must initiate the process to have the register purged of those persons who have died. Since he has overall responsibility for this department he himself should be made to explain why the name is still on the list. While the matter of Mr Chung’s name and others can be easily addressed, the weekly grousing by the PPP about preparations for elections, whether local or general, points to a broader strategy to target the administrative processes for political purposes in the short term or whenever polls are actually called. This dovetails well with the shocking assertions by no less than President Ramotar after the 2011 general elections that shenanigans at GECOM had resulted in the PPP/C being cheated of an outright majority. The groundwork is being laid by the PPP to build on this despite repeated denials by GECOM of the various allegations. It is the quintessential role reversal. Between 1990 and 1992, the PNC put enormous pressure on the reformed elections commission over processes and credibility and continued with this behaviour at the 1997 and 2001 general elections. With less than a majority of the vote in the 2011 polls and sensing the risk of a further erosion whenever elections are called, the PPP/C is clearly keeping all of its options opened. One expects that GECOM and all of its commissioners, three of whom were nominated by the government, would robustly defend the electoral preparations considering the negative impact that deliberate misinformation can have on an apathetic electorate. The public must not lose sight of the fact however that the sweeping electoral reforms agreed following the intervention of the Carter Center prior to the 1992 general elections have laid a solid foundation for credible elections which cannot be easily derailed. Counting at the place of poll, identification requirements, measures to prevent multiple voting, the cleaning up of the register of registrants and the presence of scrutineers through all parts of the process have helped to create and build the necessary confidence in the electoral system. Nevertheless, the way things are shaping up, fresh general elections could end up being the most watched since 1992. Given the qualms that have thus far been raised by the ruling party and the government, both the administration and GECOM must do all in their power to ensure that the most transparent arrangements are in place and watched by as many credible observers as might be interested. At the level of GECOM, one expects that as soon as is practicable, the Joint International Technical Assessor will be in place and the full and complete needs for the electoral machinery will be made known to both the government and the donor community so that there are no gaps. The information technology aspects of the electoral process are usually fraught with contention and one hopes that the relevant competencies are availed to GECOM. One also expects that invitations to observe the elections will be approved for the Commonwealth, the EU, the OAS, Caricom and others. This will give greater assurance to the public and obviate any concerns over some of the niggling questions that have been raised recently. Despite the pendency of the no confidence motion against it, the government still has the opportunity to call local government elections and fulfill the solemn promise it made to the electorate in 2011. This entry was posted in Editorials / Letters and tagged Stabroek News on September 1, 2014 by Osei Browne. Fearful of impacts from proposed logging activities by Bai Shan Lin in the North Rupununi, community leaders on Friday raised concerns with the Guyana Forestry Commis-sion (GFC) Board in Annai but left the meeting dissatisfied with the responses received. “I was not satisfied with the outcome of the meeting,” Chairman of the North Rupununi District Development Board (NRDDB) Michael Williams told Stabroek News. He added though that he appreciated the fact that the GFC Board took some time to meet with the leaders even as he said that time was an issue. “All the questions were not raised because of the time limit,” he said. Several representatives of the area, including toshaos, met with the GFC Board of Directors on Friday and in a two and a half hours meeting, the GFC spent half the time defending the operations of Bai Shan Lin, attendees at the meeting told Stabroek News. Williams described the meeting as “top to bottom” and said that the GFC “came to clear their names,” in light of recent media reports regarding the operations of logging company Bai Shan Lin. The NRDDB Chairman told Stabroek News that the GFC representatives did not disclose much. “All they were saying and continuing to say to us was that the process was now starting,” he said, while voicing his own skepticism about the GFC’s claims. “They (GFC) were saying that things were not happening,” he said, but the communities have been told by sources who have ventured into the area that roads are being built, logs harvested and wildlife is being hunted in great quantities. He questioned how this could be so when the company is supposed to still be in the exploratory stage. Williams, a former toshao of Annai, said that the GFC representatives told them that the process of dialogue has now begun. Bai Shan Lin in June applied to the Environ-mental Protection Agency (EPA) for permission to begin large-scale logging and sawmilling operations at its forest concessions in regions Six and Nine. The project would entail the felling, extraction of timber and transportation of same to a processing facility, grading, construction of roads, skid trails, bridges, culverts, and camps with other ancillary facilities within the concession, the EPA said. The EPA said that it recognises that the development may have significant impacts on the environment and an Environmental Impact Assessment (EIA) is required before any decision to approve or reject the proposed project is taken. Residents of North Rupununi have expressed concern that they have not been consulted for the EIA and pointed out that they have several issues that they are concerned about. Williams stated that one of the issues raised with the GFC was that the Bai Shan Lin concessions borders Apoteri and other communities and there appears to be no buffer zone and should the communities want an extension of their land, they would be unable to do so. Williams had also noted that Bai Shan Lin’s concessions were contiguous to Apoteri’s and Rewa’s land and according to the legislation, these communities should have been notified of impending developments but this was not done. He said too that it seems that the concessions cover parts of the communities’ titled lands but the maps provided by the GFC does not show the location of the communities and so they have been unable to definitively determine if this is so. According to the Forests Act, there should also be a buffer zone but since they are unable to determine the parameters of the concessions, they have been unable to determine if there is any such zone, the NRDDB chairman said. Williams noted that the communities also pointed out that it seemed to take very little time for land to be allocated to Bai Shan Lin but when the communities apply for their land, it takes years for this to be processed. He said that they were assured that any application by the communities will be dealt with expeditiously. “They said Apoteri or any other village, once they apply for extension, priority will be given to them,” he recalled and informed that in this light, Apoteri, Rewa and Crashwater will apply for extensions of their land. He said that they also expressed concerns about the Chinese use of wildlife as persons had reported that wild animals were being indiscriminately hunted in those areas. He also noted that the Arapaima Management Plan, which is undergoing revision, encompasses areas in the Bai Shan Lin concession and they are afraid what the operations could mean for this project. The NRDDB Chairman said too that concerns were also raised about a road being built and said that they were told that the company has a right to build one but not one that vehicles could access yet. Recently, Commissio-ner of Forests James Singh said that Bai Shan Lin has begun harvesting on its State Forest Exploratory permit (SFEP) 01/2013, which covers 73,015 hectares in Region Six. Singh said that the media will be invited on a field trip on a later date. North Rupununi communities have been worried about the impact that logging would have on their communities, particularly Apoteri and Rewa. The communities have been involved in conservation efforts as well as eco-tourism activities. Chief Executive Officer of the NRDDB Ivor Marslow had told Stabroek News that Apoteri, particularly, was concerned because the Bai Shan Lin concession borders the community. “Once there is road access, all sorts of hunting and thing start to happen,” he said. He had recalled that the community had requested that the area be classified as a conservation area but there has been no response from the authorities. Marslow had noted that Apoteri has a fledging eco-tourism operation and “if there is mass exploitation, there would be nothing” for people to see. “Logging brings people and people bring changes to the environment,” he noted. Williams told Stabroek News that they want more consultations and said that they understand that development has to happen but they are concerned about how it is being implemented without input from the communities. “There will be development… but when development happens, we need to be consulted,” Williams said. Bai Shan Lin has announced big plans in various sectors for Guyana but concerns have been raised by some analysts that its primary interest is logs for export, with little downstream processing. Its operations have come under increased scrutiny in recent times. The company has failed to live up to commitments to do value-added processing but government officials, including President Donald Ramotar, have defended the company. Bai Shan Lin’s access to key parts of the economy has also raised questions about the regulation of its business by the forestry commission and associated bodies. This entry was posted in Uncategorized on September 1, 2014 by Osei Browne. Former Speaker of the National Assembly Ralph Ramkarran says that Guyana should revert to a cabinet system of government with a prime minister as head and has endorsed a view that any party obtaining more than 10% of the vote would be entitled to join the government if it so wishes. “Our constitutional system has been damaged by the attachment of the presidential carbuncle to our Westminster system for no good reason other than grandiosity. It has sucked the lifeblood from a vibrant, cabinet system of government and imposed a commanding authority bloated with supreme executive power over compliant ‘advisers’ holding ministerial posts. I therefore propose a cabinet system of government with a prime minister as head of government, subject to term limits, and a cabinet with the right to vote, not as advisers as at present. The president would be a ceremonial head of state elected by a two-thirds majority of the National Assembly. Essentially, this means returning to our Independence Constitu-tion, which worked well until it was subverted,” he wrote in his Sunday Stabroek column. Ramkarran, who was an influential member of the PPP before quitting after nearly 50 years of membership, argued that until today’s politically disputatious situation, created by Guyana’s history and overshadowed by ethnicity, is contained by a workable constitutional system, Guyana will show little political and economic progress and instability will continue. He said that the first step is to persuade all political parties to accept that Guyana needs a government that includes at least the two main political parties. “The PPP once championed this position but reneged on it after gaining political office in 1992. While the PPP is dangling before the public a confusing concatenation of alliance formats, including the national democratic front, the broad left front, shared governance by first building trust, which it claims from the other side of its mouth already exists through the implementation of constitutional reforms, the ‘winner does not take all,’ but which already exists through the civic alliance, promoting a different one each day of the week, the rest of Guyana ought to move forward with the discourse on constitutional reform. The PPP will undoubtedly catch up in due course, either willingly or of necessity,” he said. The former PPP stalwart advocated a return to the Independence Constitution and said that had it been applied with the 2011 electoral results, the ceremonial president would have been obliged to invite the leader of the party, which the president believes is capable of obtaining the support of the majority of members of the National Assembly, to form the government. “Therefore, whichever party the president invited to form the government would have to satisfy him or her that it has the support of at least one other political party in the National Assembly. This would have forced the formation of a coalition government or at least forced negotiations by the party with one or more of the others for a commitment to support,” he said. “If the PPP now has concerns that 1964 might be repeated when it obtained the plurality but was not invited to form the government, the appropriate article in the constitution can be amended to impose a duty on the president to first invite the party obtaining the plurality at the elections to form the government. Only if that party declares to the president that it is unable to form a government which would receive the support of the majority of members of the National Assembly would the president be able to then invite the party obtaining the second largest number of votes to form the government. The president would have power to require a vote of confidence in the government as the first order of business of the National Assembly,” Ramkarran asserted. The former Speaker said that he agreed with Stabroek News columnist and former PPP government minister Dr Henry Jeffrey’s view that a coalition government can be ensured by a provision in the constitution that any party obtaining more than ten per cent of the vote would be entitled to join the government if it so wishes. “Of course, this would make the job of the president of inviting the formation of a government to be a mere formality,” he noted. In his ‘Future Notes’ column, Dr. Jeffrey had advocated for the establishment of a political constitution that provides for the possibility of coalition-type governments and thus contains strong institutional checks and balances to guard against the kind of executive abuse that such regimes could engender. The constitution must also seek to facilitate the development of conditions that will promote multi-ethnic politics and the resulting competitive liberal democratic state. In terms of reforms, he had said that to deal with the issue of exclusion/ inclusion, at least for a transition period, the constitution will need to provide that once a party achieves some threshold, which he suggested could be 10% of the votes, at national elections, it has a right to a pro rata share of the government. Ramkarran said that devising a system for the scrutiny of government without an opposition would be a challenge. “I do not believe that less dominance by the executive of the legislature by keeping ministers away from membership of the legislature and even electoral reform to introduce realistically sized constituencies would guarantee more independence of members of the body. Ethnically driven political solidarity and the possible interruption of benefits flowing from membership would defeat such an effort. One possibility that comes to mind is an upper chamber consisting of persons with no party political affiliation nominated from civil society by the president in his own deliberate judgment. To be effective it would have power to meaningfully influence legislation that comes before it,” he said. Jeffrey had said that Guyana should look no further than the presidential system of the United States, where the president must negotiate with members of his own party. “The president should be elected by at least 50% of the votes cast. In our developing ethnic situation, this will force those wishing to be president to craft their policies to gain support across ethnic lines and also to negotiate across parties,” he had said. “Also, to further entrench the separation between the executive and the legislature, as in the US, the executive (ministers) should not be members of parliament. The president will have the right to hire and fire his cabinet but must always keep the party proportionalities,” he wrote. “Contrary to what is sometimes thought, the fact that some ministers are nominated by the opposition would not necessarily cause persistent cabinet dissension. Rather, since the president has the right of dismissal, the opposition will also need to guard against their nominees becoming ardent acolytes of the president,” Jeffrey had said. “Furthermore, the president should not be able to prorogue the National Assembly. Both s/he and the Assembly should be in office for fixed periods and the Assembly should manage its own personnel and financial affairs and have the right to adjust and negotiate with the government the formation of national budget,” the former minister said. “In this context, we should eschew the notion of parliamentarians viewing themselves as part of the government and opposition and return to the situation where parties in parliament are, as in the US, designated majority and minority parties. They should be encouraged to view themselves as representing constituent and national interests,” Jeffrey declared. This entry was posted in Government, Politics and tagged Stabroek News on September 1, 2014 by Osei Browne. Some of the Joint Ventures (JV) involving logging company Bai Shan Lin may be illegal as provisions in the Forest Act 2009 did not come into force until 2012, forestry experts Janette Bulkan and John Palmer have said. “The choice of 2009 by the GFC staff as the first year for approval of joint ventures appeared to be based on a belief that the passage of the Forest Act 2009 by the National Assembly in January of that year meant that it entered into force immediately. 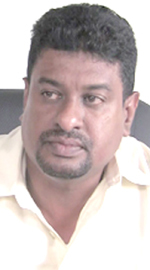 In fact, Presidential assent was delayed by a possible world-record-breaking 628 days by then-President Bharrat Jagdeo, and the commencement order required by section 1 of the Act was only signed by Minister Robert Persaud on 08 August 2012,” Palmer and Bulkan wrote in the Stabroek News last week. “In law, therefore, the Forests Act 1953/1997 continued to be the operational forest law until August 2012. Activities contrary to that law and its associated Forest Regulations 1953 were illegal until August 2012. All the so-called ‘joint ventures’ – actually, landlording – devised until August 2012, and all the approvals of such landlording by the GFC Board until August 2012, were illegal unless approved for TSAs by the Minister of Forests (the President). There is no evidence in the public domain that former President Bharrat Jagdeo gave prior formal approval to any transfers under Regulation 12 of the Forest Regulations or Condition 13 of the Timber Sales Agreements. The emphasis is on ‘prior’; there is no legal provision for retroactive approval,” the duo wrote. Commissioner of Forests James Singh told reporters at a press conference recently that Bai Shan Lin has four joint venture (JV) arrangements. In 2007, Danny Chan transferred all the shares in Haimorakabra Logging Company Inc as well as Karlam Sawmill to Chu Wenze, the chairman of BSL, and in April 2009, the JV with Wood Associated Industries Company (WAICO) was approved. The GFC board in March this year approved the JV with BSL and Puruni Woods Inc and in April approved the JV with Kwebanna Wood Products Inc.
Bulkan and Palmer identified several dealings involving Bai Shan Lin – renting or private sales of forest concessions – ‘joint ventures’ – which they said were “probably illegal” pending contradiction by formal publication of such prior approvals, with date-stamping of signatures before the dates of any joint venture contracts. The duo said that the total area of these probably illegal rentings or joint ventures is 762 000 hectares which represents over half of Bai Shan Lin’s “forest empire” in Guyana. Bulkan and Palmer identified the Haimorakabra State Forest Permission (SFP) as well as the WAICO Timber Sales Agreement and Karlam South American (Guyana) Timber as among the transactions that were likely illegal. They also identified the case of Demerara Timbers Ltd’s TSAs 02/1991 and 03/1991 in 2007 covering 492 000 ha as an undertaking that may be afoul of the law. “That no shares may actually have been transferred is not a defence because Condition 13 of the TSA licence refers to ‘any interest’, not just the company shares,” they wrote. The duo also cited the case of the A Mazaharally TSA 02/1990 or TSA 04/2009 which covers 87 000 ha, “when rented variously to Barama and to Ram Ali,” as likely illegal but when it was passed to Bai Shan Lin in April 2014, that transfer was legal. “Possibly illegal were the rentings of Nagasar Sawh’s TSA 02/1985 (29 000 ha) and Garner’s TSA 03/2005 (93 000 ha) but information is not confirmed,” they wrote. They added that there is also no evidence in the public domain that the GFC Commissioner gave prior formal approval to transfer of State Forest Permission Bce 15/1987 to Bai Shan Lin, as required by Condition 2 of 16 of State Forest Permissions. Bulkan and Palmer noted that although the illegalities of renting logging concessions were exposed repeatedly in the independent Press in early 2007, at the time of the Barama ‘bad-faith contracts’ with Amerindian communities Akawini and St. Monica in Region 1, the GFC continued to allow the other three Asian-owned logging companies to rent concessions: Bai Shan Lin, DTL and Jaling. “The chaotic situation resulting from uncontrolled renting of concessions, and the evident loss of control by the GFC over the State Forests which it is mandated to administer on behalf of the people of Guyana, contributed to the citizens’ petition against the technically weak Forest Bill 2007,” they said. The National Assembly failed to take heed, Bulkan and Palmer noted. They also said that in addition to the illegalities, the accumulations of rented logging concessions are contrary to national policy. “The 1993 timber concession policy is clear that ‘No additional areas will be granted to TSA holders until they have demonstrated their ability to work existing concessions for maximum sustained yield’ (GFC timber concession policy 1993, page 3). And ‘the grantee shall work the area to the satisfaction of the Commissioner in accordance with the terms of this Agreement’ (Timber Sales Agreement template in the second schedule ‘A’ of the Forest Regulations 1953/1982, clause 6). This clause is reiterated as ‘The concessionaire shall work the area to the satisfaction of the Commis-sioner in accordance with the terms of the concession agreement and only in accordance with the Forest Management plan, as approved by the Commissioner, . . .’ in the third edition of the GFC Code of Practice for forest operations for Timber Sales Agreement and Wood Cutting License holders,” they said. “Neither during the management by the original Guyanese concession holder nor subsequently under Bai Shan Lin have any of these concessions been worked to the maximum sustainable yield,” the duo declared. “The field audits prescribed in the same 1993 policy would have shown that the loggers were not cutting at those intensities, and therefore the concessions were not being worked in accordance with GFC prescriptions, and therefore there were no grounds for adding more concession area by adding more rented TSAs. The under-cutting in overall terms was readily acknowledged and shown in data tables during the presentation by the GFC Commissioner at the Press conference on 18 August. Thus the illegal renting of Haimorakabra in 2007 has been aggravated by the against-policy additions of other TSAs to the Bai Shan Lin forest empire,” Bulkan and Palmer said. This entry was posted in Development / Investment and tagged Stabroek News on September 1, 2014 by Osei Browne.